Unfortunately, there is a connection issue with Golf Predictor at the moment. This is a problem with the hosting service, not Golf Predictor itself. They are aware of the issue and are working on it, but the system may be down for a while. I apologise for any inconvenience caused by this issue, which is beyond my control and I ask for your patience at this time. I am pleased to report that the site appears to be back again. Thanks for your patience during this time. Danny Willett (ranked 3rd by Golf Predictor) won the Omega European Masters on the European PGA Tour. The 27 year old Englishman won his third tour title by holding off his young compatriot Matthew Fitzpatrick in the scenic Swiss mountains. The two Englishmen traded blows all day, but Willett managed to get his nose in front on the thirteenth with a birdie and kept his slender advantage until the end. Our top ranked player, Sergio Garcia, started slowly but finished strongly over the weekend to finish 6th. Overall, in an event where a lot of the bigger names failed to perform, we had only seven of the top sixteen plus ties (7/23) in total. Jason Day (ranked 3rd by Golf Predictor) won the RBC Canadian Open on the US PGA Tour. The 27 year old Australian won his fourth tour title in an exciting finish in Canada. Day got over his great disappointment in Scotland on Monday by going toe to toe down the stretch with Bubba Watson. Both players went on a late birdie binge, but Day prevailed by a single shot in the end after holing a great birdie putt on the final green. Bubba was our top ranked player and we had eight of the top eighteen plus ties (8/21). The predictions and statistics for this week, the Omega European Masters (European PGA Tour) and the RBC Canadian Open (US PGA Tour), are now available on Golf Predictor. Despite the late Monday finish to the Open Championship, there is a pretty strong line up in Canada, where a lot of combatants from St Andrews have jetted over from Scotland to tee it up. On the European Tour, there is also a decent field assembled for the popular track in Switzerland this week. Zach Johnson (ranked 12th by Golf Predictor) won The Open Championship on the European/US PGA Tour. The 39 year old American won his second major at the weather delayed event on the hallowed turf of St Andrews. Johnson came from three shots back on the final day to win a three man play-off with Marc Leishman and 2010 champion Louis Oosthuizen. Johnson birdied the first two holes of the four hole play-off and held on to win by a shot when Oosthuizen failed to birdie the last hole. Our top ranked player, Jordan Spieth, finished agonisingly just one shot back in tied 4th place in his bid for the third leg of the grand slam. Overall, we had nine of the top eighteen plus ties (9/19) in the weather affected tournament. Scott Piercy (ranked 2nd by Golf Predictor) won the inaugural Barbasol Championship on the US PGA Tour. The 36 year old American won his third tour title with an assured final day performance, hitting seventeen greens in his closing round of 65 (-6). Coming off elbow surgery last year, Piercy was naturally delighted to get back into the winner's circle after beginning the season on a major medical extension. Our top ranked player, Emiliano Grillo, finished in tied 10th and we had eight of the top nineteen plus ties (8/22) in total in this second tier event. Due to the Monday finish of the weather delayed Open Championship, the predictions for this week, the Omega European Masters (European PGA Tour) and the RBC Canadian Open (US PGA Tour), will be later than normal. The results will inputted into Golf Predictor as soon as possible, but the predictions for this week can not be generated until the latest world rankings arising out of last week's events become available. Based on the statistics on Golf Predictor for The Open Championship, here is my analysis of the tournament for betting purposes. The analysis for fantasy golf or DFS golf would be similar, except of course at the top end, where picking the favourites makes more sense (if possible from a usage or salary point of view). 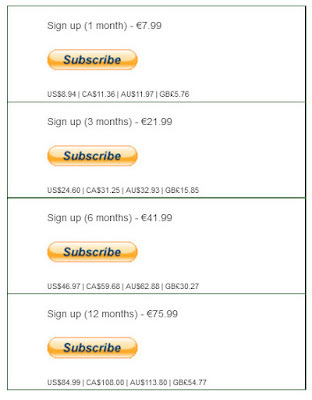 Of course, you are free to disagree and log in to Golf Predictor to make your own informed choices for the tournament! All the big names have gathered in Fife for the big one, except for the injured Rory McIlroy of course. It being Scotland, the weather could be a major factor this week. Rain and fairly high winds are forecast, so that could turn the form book on its head. However, there was a similar forecast for last week's Scottish Open and that didn't turn out too bad, except possibly for some wind on Sunday. Here's hoping for some good golf and may the best man win! Jordan Spieth's season keeps getting better and better. He overcame a slow start (mostly with a career low round!) to win for the fourth time last weekend at the John Deere. The two major wins, the two regular tournament wins, the three second places (one solo) and a tied third place finish means he is the favourite to win what would be a historic third leg of the grand slam. Rickie Fowler had a great win in Scotland at the weekend in similar conditions to what is expected at St. Andrews and is a self-confessed lover of links golf. Of the others, Zach Johnson, Kevin Kisner, Francesco Molinari and Brandt Snedeker all have good recent form also. Louis Oosthuizen won The Open Championship the last time it was held at St. Andrews in 2010. The course is also used for two rounds of the Alfred Dunhill Links Championship every year on the European Tour. Oosthuizen also has two top six finishes at this regular event in the past five seasons, but he also has two missed cuts there in the same period. Lee Westwood, Shane Lowry, David Howell, Tommy Fleetwood and Luke Donald all have decent course form too. Adam Scott is the form man in this category, with top fives at last three Open Championships. Dustin Johnson also has pretty good tournament form and he did play very well at the links style Chambers Bay until the final green! Brandt Snedeker has had two top eleven finishes in the last three years at the tournament and Luke Donald has had some good results too, although not in the past two years. Given Luke Donald's stats and welcome recent return to form with two top tens, he's a great outside pick at 90/1. Victor Dubuisson has also shown some good form lately and has some good course and tournament form in the past few years, so he could be worth a punt at 66/1. Funny to think of Jim Furyk as a long shot, but at 80/1, that's what he is! Based on their statistics, Bubba Watson, Jim Furyk and Matt Kuchar are the main undervalued golfers from the top echelon in the tournament. Bubba has never performed at The Open Championship, but Furyk was fourth last year and is coming off a win and two top fives in the recent past. Kuchar almost won in similar weather conditions on a similar type course on Sunday and finished tied twelfth at Chambers Bay in his previous outing. He also has had two top fifteen finishes in the past three years at this event. Lower down the order, Zach Johnson, Billy Horschel, Keegan Bradley and especially début man Robert Streb are undervalued by the bookies. The bookies are afraid of Oosthuizen and Fowler and they are thus overvalued. Similarly, former winners on the course, Martin Kaymer and Branden Grace, are bad value as the bookies are taking no chances with them either. Big tournament performers Jason Day and Phil Mickelson are also a little overvalued for the tournament and the deserved favourite, Spieth is too short at about 6/1. 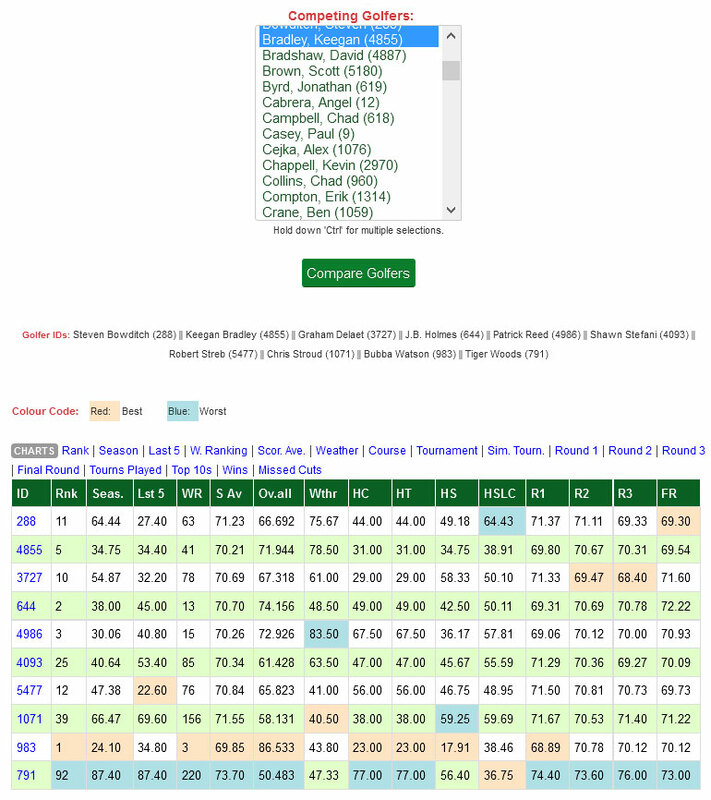 Addendum: Tiger Woods is very overvalued, given his largely abject performances this season. However, he has been showing signs of improvement lately and the course will be navigable for him with minimum use of his errant driver. Jordan Spieth, Dustin Johnson and Rickie Fowler would all be good fantasy/DFS choices, but are available at too short a price for betting purposes. Fowler at about 16/1 might be just about worth backing. The lower priced golfers who offer good value for an each way bet based on their stats are Adam Scott (about 20/1) and Shane Lowry (about 33/1). The Aussie has a great recent record at the tournament, finished tied fourth on the links style Chambers Bay last time out and is a proven major winner now. His price of 20/1 is the absolute lowest price I would ever back a golfer at. While a patriotic bet, Lowry has got a good record on the course, is coming off a great US Open and has great experience playing links golf, including that famous tournament victory as an amateur in the 2009 Irish Open. Brandt Snedeker at about 45/1 is also worthy of consideration, given his stats. Higher priced golfers worth considering are Matt Kuchar, Victor Dubuisson, Jim Furyk and Luke Donald. It is inexplicable to me why Kuchar is available at 60/1, so he should be a lock for an each way bet. Dubuisson and Donald are coming into form and have performed well at the tournament in the not too distant past. Furyk is usually a solid performer, has pretty good stats and is also available at the generous price of around 80/1. Note that the weather forecast could be vital as being on the wrong side of the draw could spell the end of a golfer's chances in this event. Therefore, it might be prudent to wait for the draw and studying the weather forecast before committing any money! Winds are forecast to be strong, especially on Friday afternoon. This favours those who start late on Thursday and early on Friday, so check the tee times before making your final selections! Friday afternoon starters include Jordan Spieth, Luke Donald, Lee Westwood, Tiger Woods, Victor Dubuisson, Dustin Johnson, David Howell, Jason Day and Louis Oosthuizen. The predictions and statistics for this week, The Open Championship (European/US PGA Tour) and the Barbasol Championship (US PGA Tour) are now available on Golf Predictor. The excitement is mounting this side of the pond for the most venerable major of them all, which returns to the home of golf for the first time since 2010. All eyes will be on Jordan Spieth, who is coming off a win in the John Deere Classic and will be aiming to complete the third leg of the mythical grand slam! Meanwhile, a second string field is lining up for the new US PGA Tour tournament in Alabama. Rickie Fowler (ranked 3rd by Golf Predictor) won the Aberdeen Asset Management Scottish Open on the European PGA Tour. The 26 year old American won his second tournament of the season and his first on the European PGA Tour with an impressive finish in Gullane. After bogeying the fourteenth, Fowler birdied three of the last four holes to win by a single stroke from Raphael Jacquelin and fellow American Matt Kuchar. 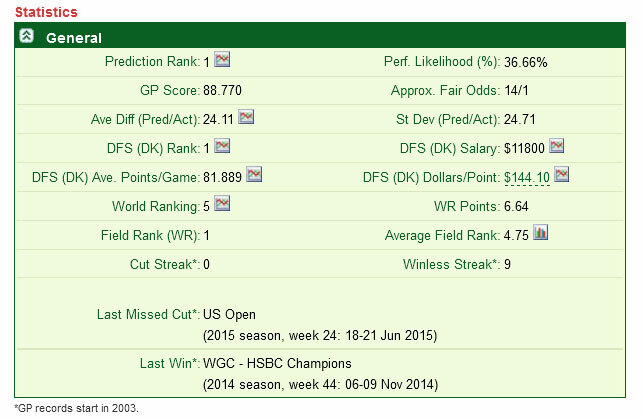 Our top ranked player, Justin Rose, faded badly over the weekend to finish 74th. Overall, we only had seven of the top seventeen plus ties (7/21). 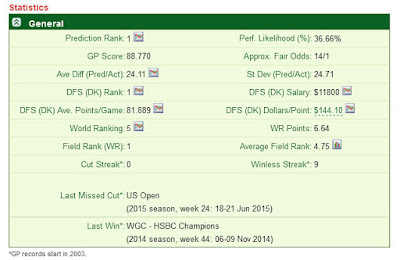 Jordan Spieth (ranked 1st by Golf Predictor) won the John Deere Classic on the US PGA Tour. The 21 year old American won his fourth tour title of a stellar season in a play-off with Tom Gillis. In doing so, Spieth won the event for the second time, becoming another event specialist, like Zach Johnson and Steve Stricker. Despite a sluggish start to the tournament and a slow start to his final round, Spieth timed his surge to tie Gillis at the end of regulation play. After Gillis found water on the second extra hole, his fate was sealed and Spieth duly took the title. It may not have been the perfect preparation for the Open Championship next week, but no doubt Spieth will be full of confidence at St Andrews. Not all the bigger names performed as, including the winner, we had seven of the top eighteen plus ties (7/23). Further to this post of about eighteen months ago, currency conversions have been reinstated on the Subscribe page on Golf Predictor. As can be seen in the screenshot above, this will make the page more useful once again to subscribers that do not have the Euro as their main currency. Instead of using a web service, this version of the page now uses the XML feed from the European Central Bank (ECB). 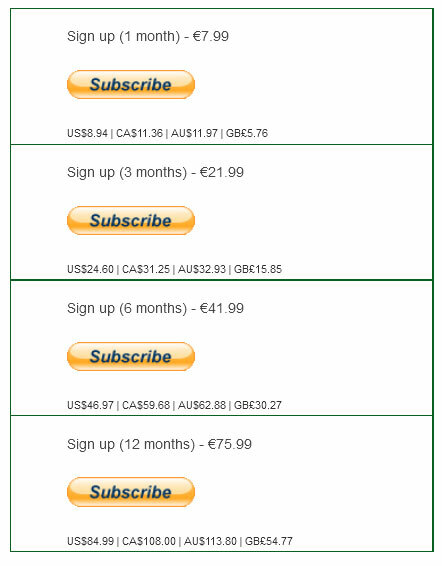 This is known as one of the more stable currency feeds, even it only updates once a day (business days only). However, while not as dynamic as the previously used web service, it should be far more reliable and sufficient to give an indication of the exchange rate. The Prediction Rankings page and GP Score. I have new found respect for any one who does this sort of thing. At the beginning at least, it is very time consuming and certainly much harder than it looks! If you think some of the videos are ropey, you should have seen/heard the first ten takes of each one! In order to get the videos made at all, I had to divide most of them into segments. These then had to be then edited and combined. I'm no Martin Scorsese, so some of the joins are not as smooth as I'd like. There is one such join near the end of the above video! I tried to speak at about 40% of normal speed in order that my Irish accent would be understandable by the widest possible audience! It does result occasionally in a slight drone, so apologies for that! I hope to improve as my recording career progresses! It is enough to inflict my voice on you. Mercifully, my face does not appear in the videos! I am now really sick of the actual sound of my voice, as opposed to the sound of my voice I hear normally through my skull! I had some microphone issues and coupled with the lack of recording facilities, the sound quality isn't what I would have liked on these initial videos. I may look to sourcing a new microphone for future recordings. The YouTube uploading process doesn't seem to have helped either. Good quality speakers or headphones will help with the audio quality (but not my accent!) however. I had considerable trouble sourcing the screencasting software. There were problems with each one that I tried. The software that I settled on allowed the capture of the mouse (most of the time!) or the display of the dropdown box options with different settings, but not with the same setting! This put restrictions on what could be shown in some videos. The videos have all been recorded in 720p HD which I found after experimentation was the best compromise between quality and file size. I was able to fix a few minor issues and improve some functionality on Golf Predictor as a direct result of making these videos, so they were useful for something! The videos are numbered with 1xx representing general topics, 2xx representing topics from the first menu item (Predictions), 3xx representing topics from the second menu item (Form) and so on. In general, it would be best to view them in order, but I have left gaps in the numbers in case future videos have to be added logically between two existing ones. I have created a "Golf Predictor Tutorials" playlist with the suggested order of videos. Of course, you can watch them in any order you wish, but some build on others, so you might like to follow this playlist. Rather than re-record (yet again!) some otherwise good segments, I have corrected/noted some boo-boos and slightly garbled speech with annotations to the videos. I also use these annotations to impart extra information not mentioned in the videos, so watch out for those! I have linked to this new YouTube channel from the site home page, About GP page and member home page. I trust you will find these new video tutorials useful and please subscribe to this new channel. Any feedback (via comments on this article or email) would be most welcome. Hopefully, this YouTube channel will help you reap the full benefits of Golf Predictor, the premium professional golf statistics site. Based on the statistics on Golf Predictor for the John Deere Classic, here is my analysis of the tournament for betting purposes. The analysis for fantasy golf or DFS golf would be similar, except of course at the top end, where picking the favourites makes more sense (if possible from a usage or salary point of view). Of course, you are free to disagree and log in to Golf Predictor to make your own informed choices for the tournament! As usual for this event, which is held the week before the Open Championship on a different continent, there aren’t a lot of big names in the field. While most of the top golfers are already in the British Isles honing their links course skills, Jordan Spieth and Zach Johnson are the biggest names joining the event’s biggest supporter, Steve Stricker, in Illinois. The weather may be be a little wet on Friday and Saturday, but shouldn't be a major factor this week. Except for his blow out at the Players Championship, Jordan Spieth has had an incredible season, with his two major wins, three second places (one solo) and a tied third place finish. More recently, he’s coming off that Chambers Bay victory of course, but he also has second and third place finishes in his last four events. Zach Johnson, Kevin Kisner, Steven Bowditch, Robert Streb and Tony Finau also have good recent form. Of these, while being consistent, Finau hasn’t finished in the top five in his PGA Tour career yet. All the others have at least one top five in their last five events, one achieved without a putter for half of his final round (Streb at the Greenbrier Classic)! Steve Stricker and Zach Johnson are the real course specialists, both with an impressive record over the last six seasons at TPC Deere Run. Stricker has had three consecutive wins here from 2009-2011 and backed it up with two top tens and a tied eleventh place finish since then. Johnson also has an amazing recent record on the course with a win in 2012, three runners up finishes (one solo) and a tied third place in the last six seasons. Of the guys with less course history, Jordan Spieth and Scott Brown both have two top seven finishes here in the last three seasons, with Spieth recording the first win of his already impressive career here in 2013. Scott Brown has good course form and solid recent form, including one tied twelfth place finish. This makes him a good long shot pick. Chad Campbell has had two top fifteen finishes in the last two years here and is showing decent recent form, including a top ten in the FedEx St Jude Classic. Based on their statistics, Steven Bowditch, Robert Streb and Tony Finau are the main undervalued golfers from the top echelon in the tournament. Lower down the order, Scott Brown and especially Chad Campbell are undervalued by the bookies. Obviously, the bookies are very afraid of Jordan Spieth and Zach Johnson and are priced to deter backers. The consistent Kevin Kisner doesn’t offer much value either. Justin Thomas is very overvalued, especially in light of his meltdown last Sunday at the Greenbrier Classic. Defending champion Brian Harman is also somewhat overvalued as the bookies are putting too much stock in his win last year and his third place finish last time out at the Travelers Championship. Both Jordan Spieth and Zach Johnson have great stats, but they are priced accordingly. Spieth is available at a prohibitively low price of around 4/1. Zach Johnson is not much better, available at around 10/1 with most bookies. Part timer Steve Stricker hasn’t been playing enough or well enough this season, so he is available at a more generous 30/1. He has been off the boil recently and is thus hard to back, despite his great record at TPC Deere Run. Serial play-off loser Kevin Kisner has been knocking on the door lately, but at around 16/1 his price isn’t very attractive. Tony Finau (about 40/1) has had good recent form, without placing at any event and his length won’t be a huge advantage on this average length course. The golfers who offer good value for an each way bet based on their stats are Robert Streb, Steven Bowditch, Scott Brown and Chad Campbell. Streb (around 33/1 to 40/1) and Bowditch (around 50/1) know how to win, have good recent form and are available at decent prices. Bowditch has had top twelve finishes in the last two years here, while Streb has had two solid, if not spectacular, results at the event. As for the long shots, Scott Brown has good course form and solid recent form, including one twelfth place finish, thus making him a good pick at around 66/1. Punters wishing to push the boat out a little further should consider Chad Campbell, who is available at around 100/1, despite having similar recent and/or course stats to many of the more fancied players. Cut streak and winless streak have been moved to the bottom of the panel, so they are directly above the details for the last missed cut and last win. 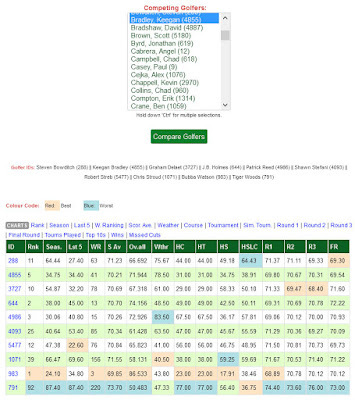 Field Rank (WR) has been moved down under the other world ranking data and this now leads on to the average field rank, which has been moved to the right hand side of this row. The GP score row has been moved up to underneath the prediction rank. Since the latter is bases on the former, this makes sense. The performance likelihood has been moved up to the prediction rank row, where it now resides along with the other GP generated metrics (rank, GP score and fair odds). No new information was added, but I believe this improves the digestibility of the information. Hopefully, after a short period of acclimatisation, you will agree. Just another way to make Golf Predictor a little better!